I spent Christmas 2011 in Texas with my mom, aunt, and meemaw. I got to hear the story of how meemaw met my grandpa, got to know my great-great-great-grandparents through pictures and stories, and frequented several thrift/antique stores. It was a trip full of memories that I hope to keep with me forever. Meemaw works part-time at a thrift store in town, and we got after-hours access. Is it sad that I was just as excited about that as going backstage at a concert? Anyway. I found this cute handpainted wooden snowman sticking out of a basket. I hadn't seen an ornament quite like that. It was hard to decide if it was really tacky, or if it could work as an adorable kitschy new collection. It was definitely vintage. I started digging through the basket and found another handful of these ornaments! I really love collecting these now! They're inexpensive, readily available at thrift stores, and you can't beat how they look. Check out this guy! He's my favorite. Keeping watch over the Christmas tree. I ended up with a few duplicate ornaments this year, so I'll be attaching some of my favorites to Christmas packages. A perfect touch! 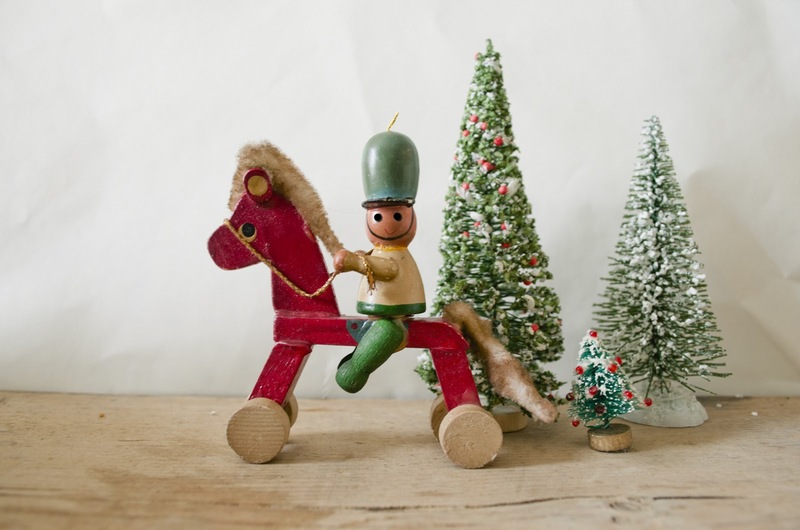 I'm giving away a 'starter kit' of vintage wooden ornaments for one lucky commenter! 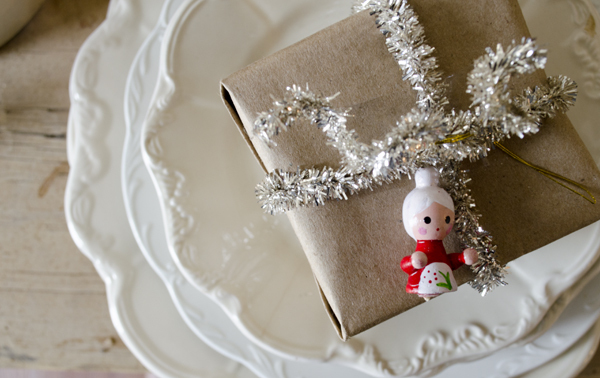 You'll receive five of my favorites, along with a few other vintage Christmas surprises! I'll choose a random winner next Friday, November 30th! Comment and tell me what your favorite Christmas collections are! 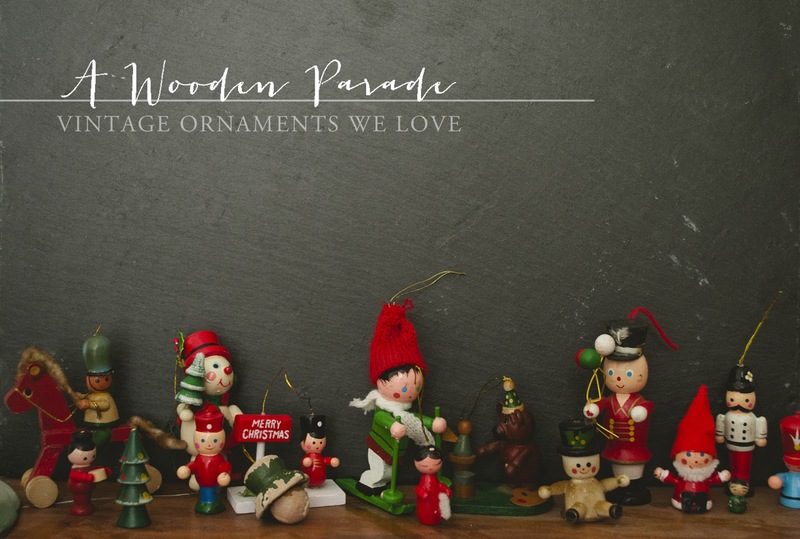 I love these wooden ornaments as well! I have a small collection, including a few music boxes. Last year I found a bag full of these guys at our Good Will but they were in less than great shape. I'm thinking of making a wreath with the misfits. Thanks for sharing your collection. Ohhh...these little pretties are near and dear to my heart. : ) I love using them on packages too! Happy Christmastime!!! ps I already "like" your fb page. I liked and shared, love the idea of usi g to wrap presents so cute! 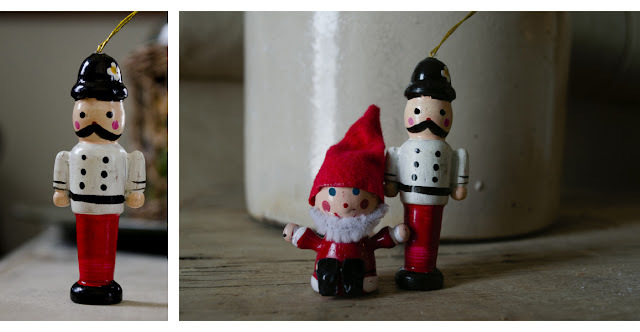 Love these ornaments! Reminds me of my foster grandma's ornaments. Hi Yvette!! You won our giveaway!!! Can you pleas provide an email address and we will contact you about your ornaments!! Thank you!! So perfectly sweetly kitschy! Love you collection! I too would be giddy about a back stage pass to the thrift store! SO FUN! 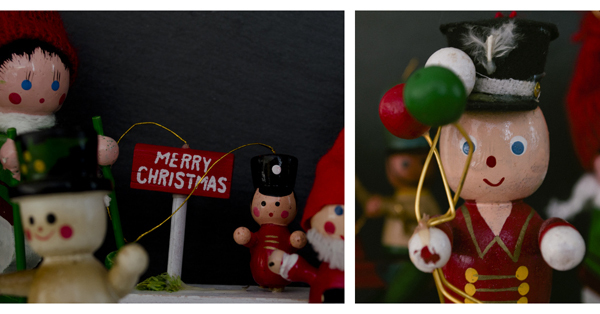 My favorite Christmas ornament collection are the 20 or so I have from when my mom and dad were first married. They were broke and didn't have many decorations, so my mom painted these wooden ornaments. Love em'. We have so many special ornaments, the ones the kids made, the first ornaments, the ones we bought together, those that were gifts... They are so much fun to put on the tree, wonderful memories come flooding back! My latest Christmas collection craze is different colored bottle brush trees. I already follow you on fb! I love these vintage wooden ornaments--I pinned them! 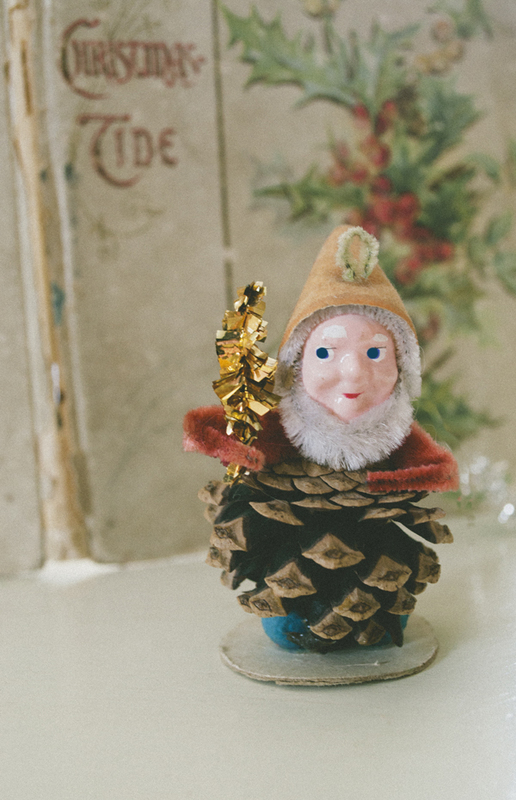 I've been collecting cutesy vintage ornaments since I was a kid...my grandma collected shrinky-dink characters and little ceramic/wooden European elves and got me hooked! I think my personal favorites are from my little collections of glass mushroom ornaments with little clamps on the feet. So cute on a tree! 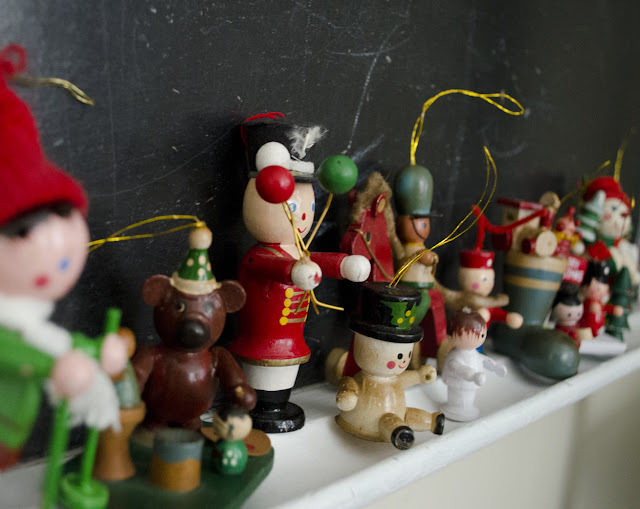 When David and I got married in Dec of '83, his grandmother gave us lots of Christmas ornaments as a wedding gift. We got several of these little wooden ornaments from her. Sorry to say, I don't have many of them left. Every year my children get an ornament, even now as adults they still want to get one. I love those ornaments the best:). Great collection, glad I found your blog.